Is big hair a thing of the past? Has The Goldbergs TV show been cancelled or renewed for a seventh season on ABC? 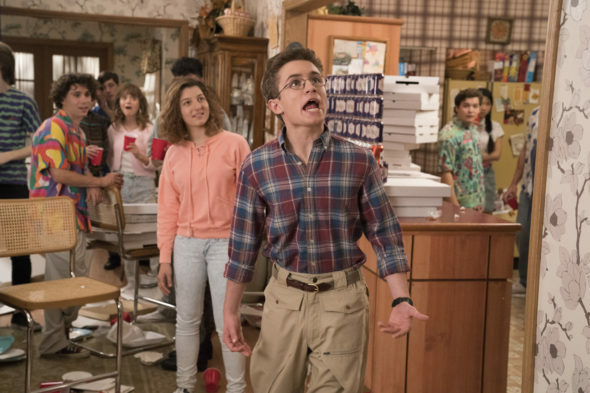 The television vulture is watching all the latest cancellation and renewal news, so this page is the place to track the status of The Goldbergs, season seven. Bookmark it, or subscribe for the latest updates. Remember, the television vulture is watching your shows. Are you? An ABC sitcom, The Goldbergs stars Hayley Orrantia, Troy Gentile, Sean Giambrone, Wendi McLendon-Covey, Sam Lerner, Patton Oswalt (narrator), and AJ Michalka, with George Segal and Jeff Garlin. The 1980s period comedy centers on the Goldberg family from Jenkintown, Pennsylvania. Youngest son Adam (Giambrone) videotapes his family’s craziness and provides commentary as an adult (Oswalt). In season six, the whole clan is back under one roof, and wedding bells are ringing. The sixth season of The Goldbergs is averaging a 1.20 rating in the 18-49 demographic and 4.96 million viewers. Compared to season five, that’s down by 17% and 11%, respectively. Find out how The Goldbergs stacks up against other ABC TV shows. As of April 23, 2019, The Goldbergs has not been cancelled or renewed for a seventh season. Stay tuned for further updates. Will ABC cancel or renew The Goldbergs for season seven? I suspect the series will be renewed now that the series has gone into syndication. For now, I’ll keep an eye on the ratings and update this page with breaking developments. Subscribe for free alerts on The Goldbergs cancellation or renewal news. TV show ratings are still important. Follow The Goldbergs‘ weekly ups and downs. Find more of The Goldbergs TV series news or other ABC TV show news. What do you think? Do you hope The Goldbergs TV show will be renewed for a sixth season? How would you feel if ABC cancelled this TV series, instead? The Goldbergs is the greatest thing since The Wonder Years, only BETTER. However, seeing the new spinoff show sounds not so interesting . What they NEED TO DO INSTEAD for a spinoff is a show about Adam and his wife in later years with THEIR KIDS. Now THAT would be a jewel and a half! GOTTA KEEP BEVERLY’S CHARACTER VITAL in my better version of a spinoff. NO ONE IS GOING TO BE THAT INTERSTED in following any story of the girl teacher and the school stuff. FORGET IT! I rate that a PRE-CANCELLED SHOW.